North Korea will favorably consider participating in an international gymnastics event in South Korea this year, Seoul's gymnastics federation said Tuesday, after discussing its plans with the sport's international governing body. According to the Korea Gymnastics Association (KGA), North Korea told International Gymnastics Federation (FIG) President Morinari Watanabe, who visited Pyongyang with a delegation last week, that it will review proposals for competing in the Korea Cup international gymnastics competition on Jeju Island in June. The KGA said North Korea also showed its willingness to form a joint artistic gymnastics team at the 2020 Tokyo Olympic Games. The two Koreas are scheduled to meet at the International Olympic Committee (IOC) headquarters in Lausanne, Switzerland, on Feb. 15 to discuss plans for fielding joint teams at the 2020 Summer Games. The two sides have yet to confirm the disciplines in which they wish to form unified teams. "At this moment, we have no idea what North Korea thinks about joint teams," a KGA official said. "We asked them to invite our officials to Pyongyang during the FIG's visit, but it didn't happen." The KGA said there are still many hurdles, such as the team selection process, to overcome to form a joint gymnastics team, but it was hopeful that that the proposal can make substantial progress if North Korea participates in the competition on Jeju Island. 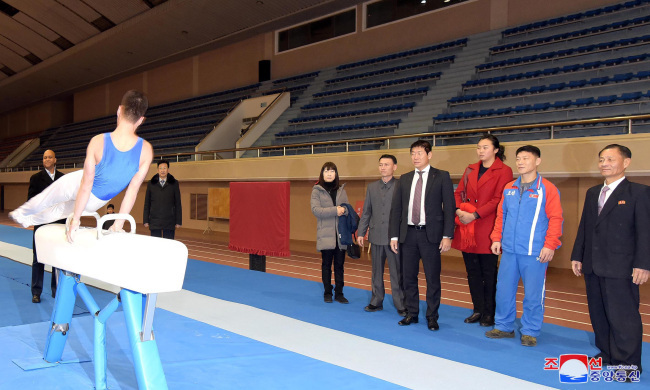 (Yonhap) SEOUL, Jan. 29 (Yonhap) -- North Korea will favorably consider participating in an international gymnastics event in South Korea this year, Seoul's gymnastics federation said Tuesday, after discussing its plans with the sport's international governing body.